Social media and tourism marketing go hand in hand. Taking on social media can be challenging, especially with limited time and budget. In this series, I’ll explore best practices for destinations and attractions across different channels. 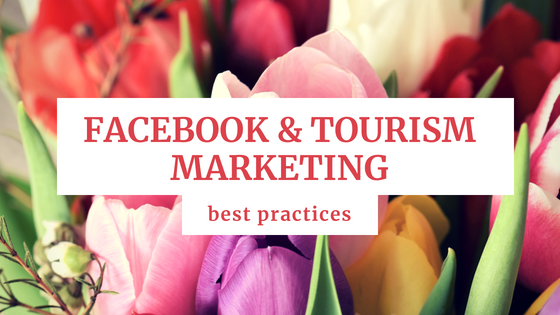 In this blog, we’ll explore Facebook and tourism marketing. Ah, Facebook. The social network so popular, everyone from your little cousin to your grandmother is on it. Of all the social media channels we’ve covered so far, Facebook has the biggest reach and most diverse audience. This makes it an ideal channel for almost every kind of business to find their target audience, destinations included. While we dive into a few key considerations, keep in mind they are all connected in the grand scheme. How many followers do you have? As a general best practice, pages with fewer than 10,000 – 15,000 followers don’t need to post every day. When is your audience online? It does no good to schedule your posts at noon if your audience is most active at 7 am and 4 pm. You can see an overview of when your audience is most active under Insights – Posts – When Your Fans are Online. What type of posts do best with your audience? Identify that piece of content, and what was special about it. If your audience loves behind-the-scenes photos, or food recipes, consider increasing the frequency of those posts. If you’re curious about Facebook engagement throughout the years, and how the recent changes have affected it, Buffer has a great breakdown based on analyzing 43 million business page posts. The gist of the article is regardless of content or posting frequency, business pages have seen an overall decrease in engagement. This is due to several factors, including the algorithm and an increase in competition for eyes on posts. Audience engagement and posting frequency go hand in hand, so by analyzing the posts that do best with your audience, including content and time of posting, you’ll be able to more accurately find the happy posting medium. It’s no secret that of all the types on content, visual does best on Facebook. But long gone are the days where you could put a photo in a video format to boost engagement (just kidding- that never worked). With a decrease in engagement, good content is more important than ever. But don’t stress if you don’t have time to go out and gather gorgeous photos of your destination for all seasons? Utilize existing assets, like local influencers or travel writers you’ve brought in, and ask to use their content. As long as you give credit where it’s due, re-post away! Bonus: Using other people’s photos lends an element of credibility, which potential customers (or visitors in this case) love to see. Drone photography and video are a hot topic right now, and for good reason. Seeing shots like the ones in the below video from I LOVE NEW YORK are striking and memorable- everything we want our destinations to be. Facebook undoubtedly has the most in-depth analytics and measurement thanks in part to the enormous amount of information it has. However, this amount of data can be overwhelming, and it can be difficult to sort through and find the analytics that are most relevant to you. Find your analytics under Insights, and export data ranging from one week to a full quarter. The maximum for a download of insights is three months. They report on everything and anything, so take 30 minutes to download a report and familiarize yourself with all the measurements they provide. From obvious numbers, like page likes, to more granular analytics like total check-ins from a mobile device. Your analytical needs will vary based on your organizational needs, and even month to month. While this is another topic in and of itself, the consensus is Facebook is decreasing organic reach of business posts to encourage promoted posts. They want you to increase your advertising and spending more money. Camille wrote a great whitepaper that explores the basics of advertising on Facebook. It’s worth making a note that of all the options for social media marketing, Facebook ads have the most detailed targeting, and are the most affordable. You can run ads for as little as $1/ day, perfect for any small business.